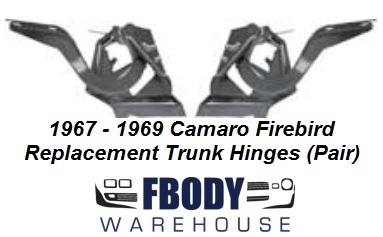 Reproduction of the original trunk lid hinges for 1967 1968 1969 Camaro & Firebird models. Correct reproduction of original attaches to trunk lid and upper rear body panel allowing the trunk lid to open and close smoothly as original. Replace worn out or rusted units easily at home! Use the drop down menu to select shipping locations.